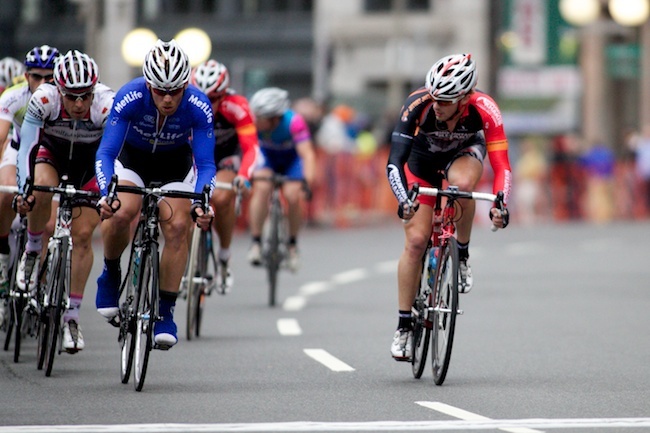 Sunday marked my first ever foray into the world of competitive road bicycle racing. 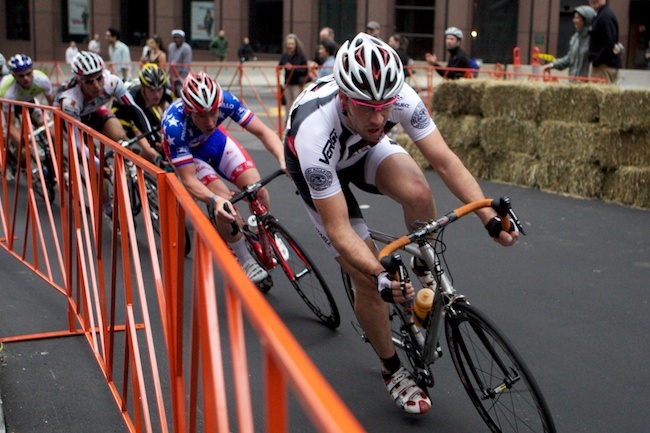 Having raced mountain bikes back in my youth, I was familiar with the strategies of cycling in close quarters… but a criterium race is something different altogether. It’s almost like the roller derby of bicycle racing. 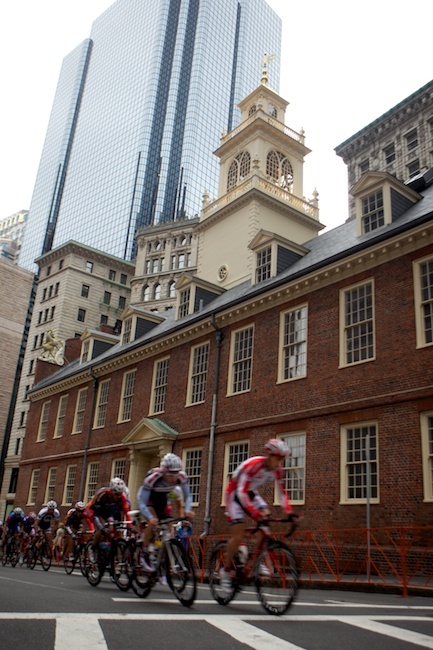 Here’s a collection of images from the men’s pro race at the Boston Mayor’s Cup race, which capped a weekend of all-around cycling free-love and good times in the city. 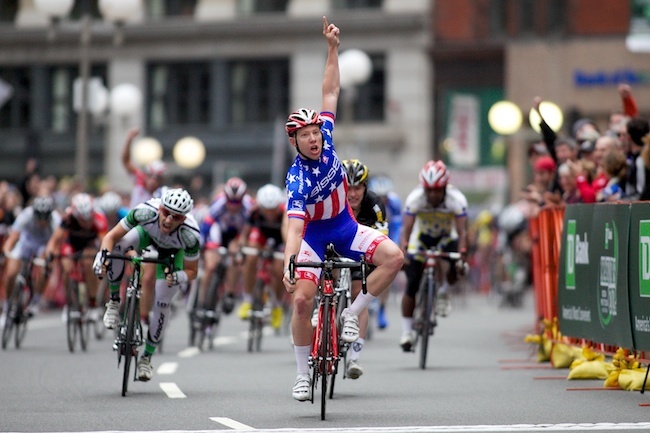 9.26.2010 — BOSTON — Bissell Pro Cycling's Daniel Holloway, wearing stars and stripes as the criterium men's national champion, celebrates his victory as he crosses the finish line for the 2010 Mayor's Cup Men's Pro division criterium race on Sept. 26, 2010. 9.26.2010 — BOSTON — Riders in the 2010 Mayor's Cup Men's Pro division criterium race pass the Old State House on Sept. 26, 2010. 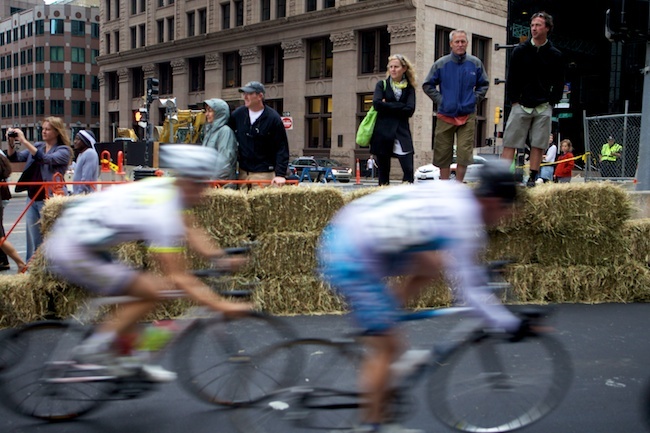 9.26.2010 — BOSTON — Fans climbed up on hay bales a the corner of Congress and State Streets to watch the riders make the turn in the 2010 Mayor's Cup Men's Pro division criterium race on Sept. 26, 2010. 9.26.2010 — BOSTON — Clayton Barrows of the AXA Equitable Cycling Team/CRCA makes the turn at Congress and State Streets as eventual winner Daniel Holloway of Team Bissell, in stars and stripes, follows, in the 2010 Mayor's Cup Men's Pro division criterium race on Sept. 26, 2010. 9.26.2010 — BOSTON — Team Mountain Khakis rider Isaac Howe, right, tries to break away from the main pack in the 2010 Mayor's Cup Men's Pro division criterium race on Sept. 26, 2010. Falling behind would be an understatement for the amount of catching up I have to do on this blog. I had my first day off in 6 weeks, if that’s any indication of what kind of workload I’ve had. But to jump back on top of my updates, here’s an update from the Deutsche Bank Championship, held over Labor Day weekend at TPC Boston, down in Norton, Mass., featuring none other than the (in)famous Tiger Woods. Here’s a selection of easily the most-followed player at the tournament — Tiger himself — from my second day covering the tournament, followed by the first. 9.5.2010 — NORTON, Mass. 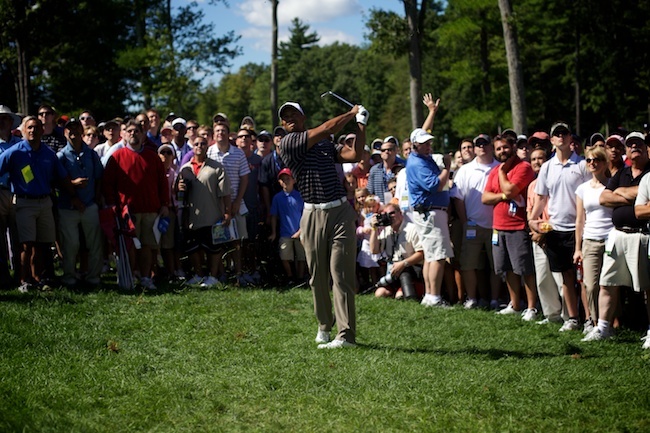 — Tiger Woods escapes from the deep rough from within the crowd at on the 2nd hole in the third round of the Deutsche Bank Championship at TPC Boston on Sept. 5, 2010. 9.5.2010 — NORTON, Mass. 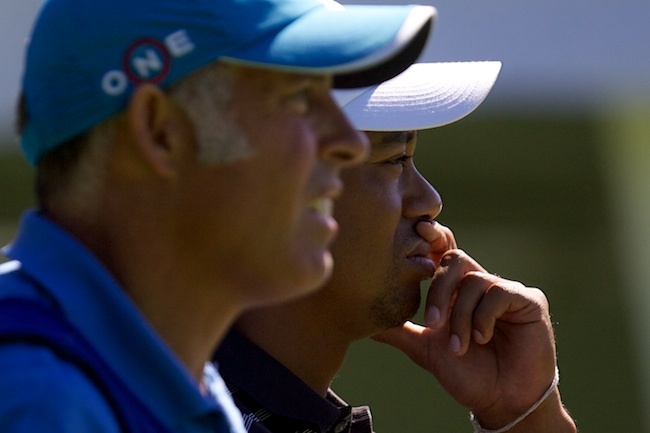 — Tiger Woods and caddy Steve Williams survey the 1st hole from the tee at the tee box in the third round of the Deutsche Bank Championship at TPC Boston on Sept. 5, 2010. 9.5.2010 — NORTON, Mass. — Tiger Woods makes a sand save out of the 3rd green bunker at the third round of the Deutsche Bank Championship at TPC Boston on Sept. 5, 2010. 9.4.2010 — NORTON, Mass. 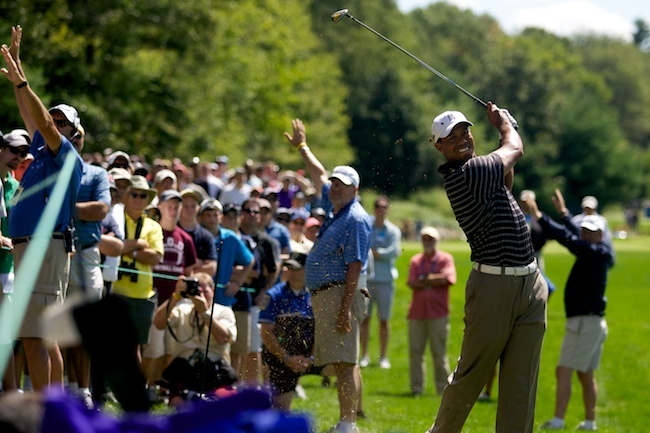 — Tiger Woods hits out of the rough near the audience on the 7th hole at the third round of the Deutsche Bank Championship at TPC Boston on Sept. 4, 2010. 9.5.2010 — NORTON, Mass. 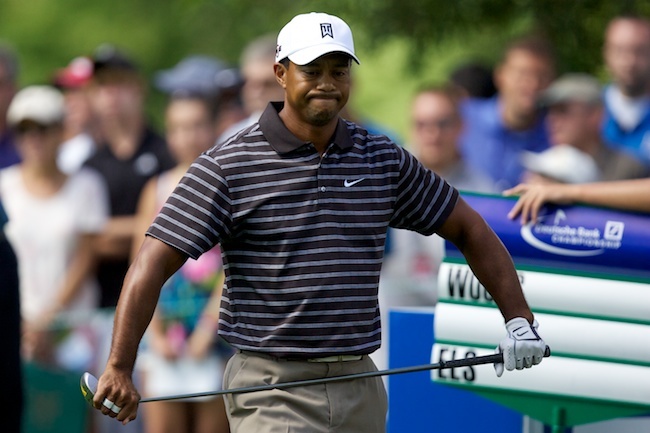 — Tiger Woods pouts after driving into the 6th hole rough at the third round of the Deutsche Bank Championship at TPC Boston on Sept. 5, 2010. 9.5.2010 — NORTON, Mass. 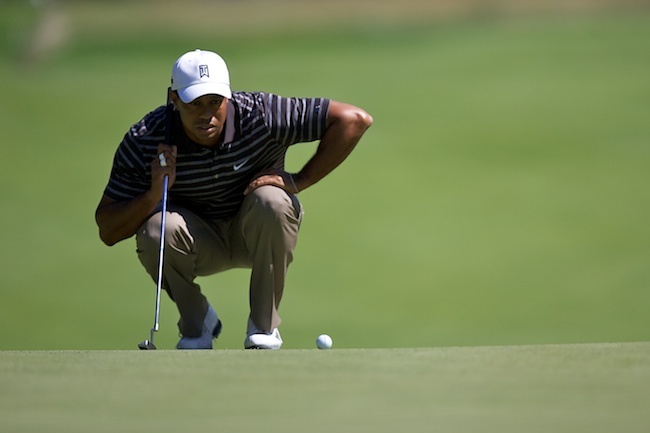 — Tiger Woods lines up a putt on the 1st green in the third round of the Deutsche Bank Championship at TPC Boston on Sept. 5, 2010. 9.4.2010 — NORTON, Mass. 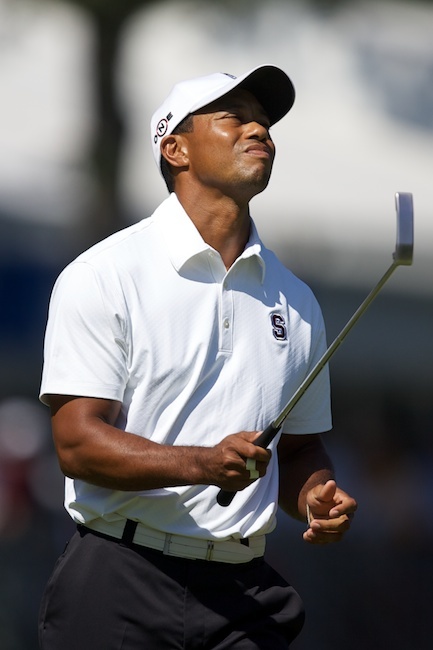 — Tiger Woods cringes after missing a short putt on the 16th green at the Deutsche Bank Championship at TPC Boston on Sept. 4, 2010. 9.4.2010 — NORTON, Mass. — A Deutsche Bank Championship spectator sticks out his tongue at Tiger Woods as he makes his way to the 14th tee box at TPC Boston on Sept. 4, 2010. 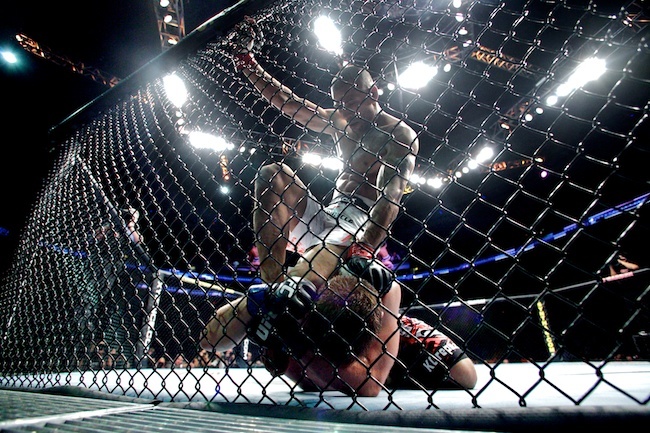 In what seemed like a summer-long buildup, the Ultimate Fighting Championship finally made its way to Boston a few weeks ago. And luckily for me, I was sent to cover it for the Boston Herald. Here are a few shots from the fights. You can see a whole bunch more in my Photoshelter gallery. 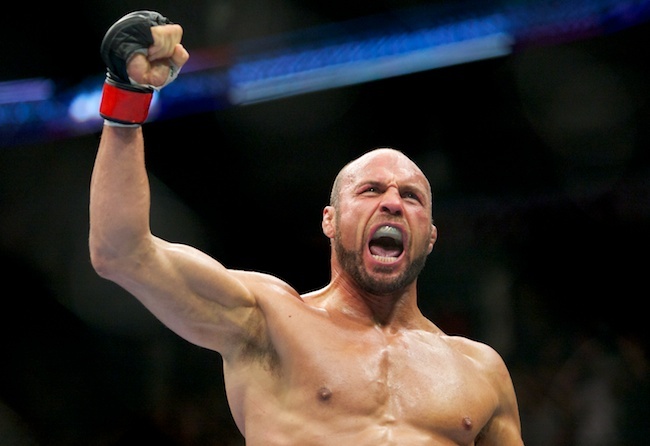 8.28.2010 — BOSTON — Heavyweight Randy Couture celebrates his submission win over James Toney at UFC 118 at the TD Garden on Aug. 28, 2010. 8.28.2010 — BOSTON — Heavyweight Randy Couture pounds on James Toney in the corner at UFC 118 at the TD Garden on Aug. 28, 2010. 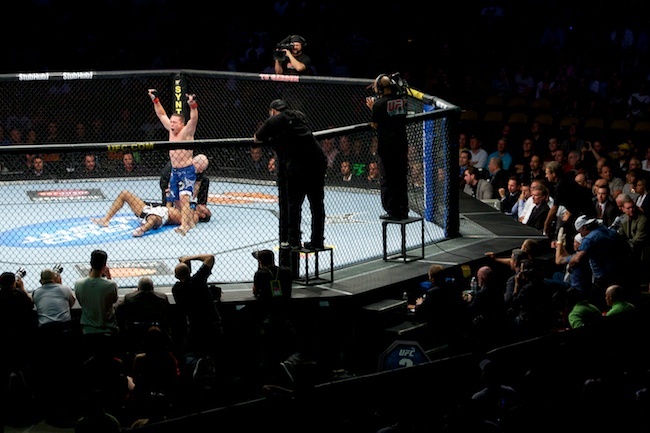 8.28.2010 — BOSTON — Welterweight Greg Soto begins his celebration in the closing seconds of his bout against Nick Osipczak vat UFC 118 at the TD Garden on Aug. 28, 2010. 8.28.2010 — BOSTON — Lightweight Andre Winner puts a knee into the back of Nik Lentz in their bout at UFC 118 at the TD Garden on Aug. 28, 2010. 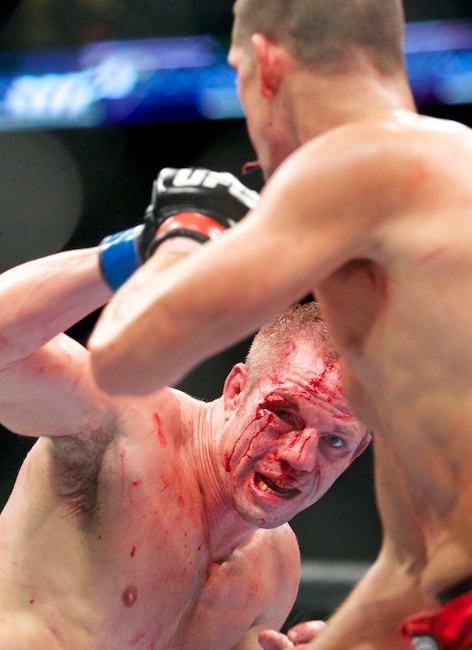 8.28.2010 — BOSTON — Welterweight Marcus Davis squares off with Nate Diaz in their bout at UFC 118 at the TD Garden on Aug. 28, 2010. 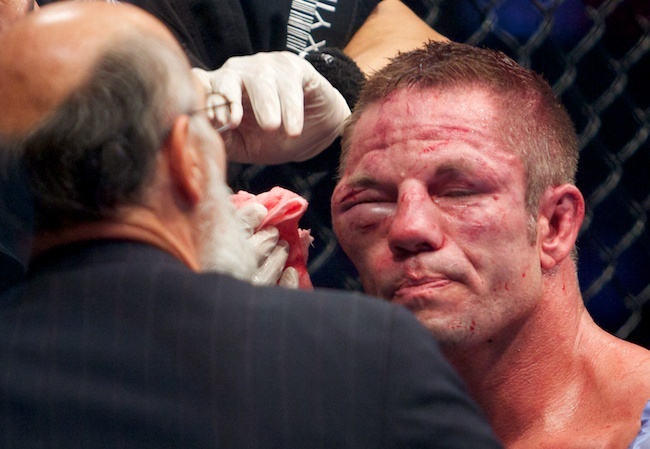 8.28.2010 — BOSTON — UFC doctors tend to welterweight Marcus Davis' severely damaged right eye after his loss to Nate Diaz at UFC 118 at the TD Garden on Aug. 28, 2010. 8.28.2010 — BOSTON — Welterweight Mike Pierce celebrates his win over Amilcar Alves in their opening bout at UFC 118 at the TD Garden on Aug. 28, 2010.